Golden State Warriors Break Record For Best Start In NBA : The Two-Way MVP Stephen Curry led his team to a milestone victory with a 111-17 win over the Los Angeles Lakers on Tuesday. The Warriors have now won 16 games in a row. 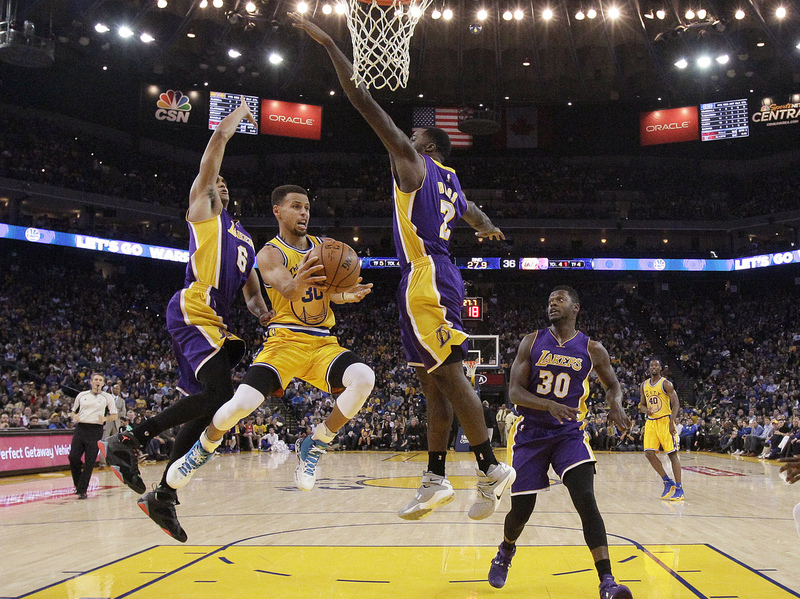 Golden State Warriors guard Stephen Curry, center, looks to pass as Los Angeles Lakers Jordan Clarkson (6), Brandon Bass (2) and Julius Randle (30) defend. The Warriors won, 111-77. With Tuesday night's 111-77 win against the Los Angeles Lakers, the Golden State Warriors set a new record for the best season start in NBA history, with 16 uninterrupted victories. The Warriors surpassed the 15-0 starts of the 1948-1949 Washington Capitals and the 1993-1994 Houston Rockets, playing in front of a standing-room-only crowd at Oracle Arena. They were in their home venue but without their regular coach — Steven Kerr is recovering from back surgery while Luke Walton, a former Laker, serves in the interim. 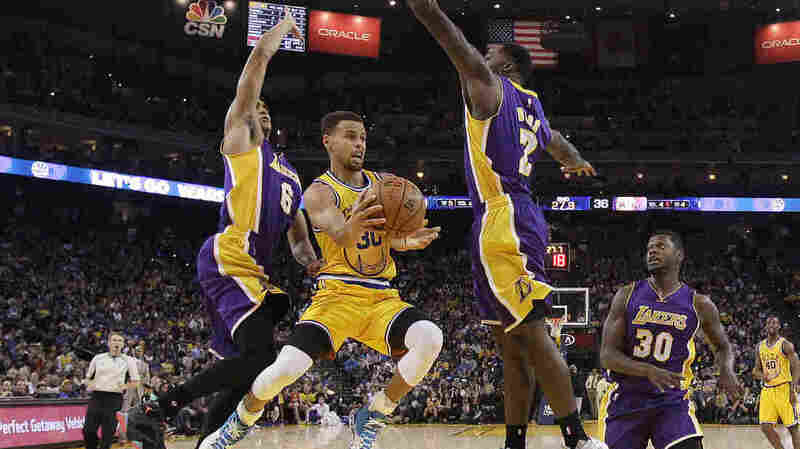 NBA MVP Stephen Curry led his team in scoring with 24 points and nine assists. He says despite the team's strong showing early in the season, the Warriors aren't likely to rout every opponent on the schedule. "It's a special accomplishment any time you can do something that hasn't been done before," he said. "It's not going to be total dominance for 82 games." Golden State is dominating the rest of the NBA, captivating fans everywhere – and it could continue for at least the next month. The Warriors don't face an elite team until a Christmas Day matchup against the Cleveland Cavaliers. The Warriors are the reigning NBA champs, having beaten the injury-plagued Cavs in last year's playoffs. If the Warriors are able to keep winning, two more records are up for grabs. The 1971-1972 Lakers won 33 consecutive games for the longest streak in NBA history and the 1995-1996 Bulls had a record 72 total victories in a season.